MICHIGAN TRUTH SQUAD ANALYSIS: "The Rendon Record" and "Bruce Rendon"
Truth Squad call: Warning on Michigan Democratic Party. Foul on Rendon. This Truth Squad report covers numerous campaign materials from both sides in the race for the seat in District 103 of the Michigan House of Representatives. Questionable statement: "Shouldn’t our leaders be fighting to protect us instead of launching negative attacks to protect their jobs?" So why is Bruce Rendon attacking Lon Johnson?" Republican state Rep. Bruce Rendon is facing Democrat Lon Johnson in the 103rd House District, which consists of Kalkaska, Missaukee, Roscommon and Ogemaw counties. It’s considered a key race for Democrats in their attempt to recapture a majority in the House, now controlled 64-46 by the Republicans. The ad doesn’t explain Rendon’s attacks on Johnson. But Michigan Radio reported in August that Johnson became upset after Rendon sent out a fundraising letter noting that Johnson’s wife is the deputy manager of President Barack Obama’s re-election campaign. Johnson sent a letter to Rendon, telling him to stop using his wife as a campaign issue. Johnson married Julianna Smoot in 2011. At the time, Johnson was listed as partner in a Nashville-based private equity fund. He now lives in Kalkaska. Questionable statement: "Maybe it’s to hide the fact that he voted to tax seniors’ pensions and retirement income." The ad refers to House Bill 4361, which taxes pensions, based on the birth date of the taxpayer, and institutes a new corporate income tax, replacing the Michigan Business Tax. Rendon voted with the Republican majority to approve the bill. Questionable statement: "Or maybe because he cut needed services for Michigan’s veterans." The ad cites HB 4361 on this claim. The bill alone doesn’t cut veteran services. But Democrats have complained that a $1.7 billion business tax cut resulting from the elimination of the MBT has left less money in the state budget to aid veterans. For the 2012-13 budget year, the House and Senate agreed on a departmental budget that increased state spending about $15 million from the 2011-12 levels. According to the Michigan Budget Office (scroll to page 133), the department’s state general fund support dipped from $39.54 million in fiscal 2008 to $33 million for fiscal 2012. The fiscal 2012 budget was the first approved under Gov. Rick Snyder. Questionable statement: "One thing’s for sure: Bruce Rendon’s negative attacks can’t cover up the Rendon record." On the screen, the ad says that Rendon "Voted against our kids." It refers to House Bill 4325, the 2011-12 school aid appropriation budget, which reduced expenditures by about $930 million from the previous year. Overall impression: This is a tough political ad. Rendon did vote on these bills, which taxed pensions, trimmed business taxes and resulted in cuts to spending programs that benefit children and veterans. Foul or no foul: Warning, which is "a statement that could easily be misconstrued, but is generally truthful." Rendon's voting record is clear, but the context is not. For example, the tax on pension income for those 67 and older differs from the regime for those younger than 67. Questionable statement: "No new taxes should be created. 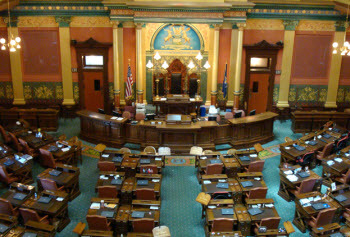 One of our biggest factors in keeping jobs in Michigan is the taxation of business profits. A supermajority vote in the legislature should be required to raise a tax or to create a new one. It is my belief that taxes should be shared amongst all segments of society." Rendon's statement would appear to make him a supporter of Proposal 5, the supermajority tax proposal on the Nov. 6 ballot. However, he is not listed among the supporters on the pro-Prop 5 ballot group's website. But it's hard to square Rendon's statement with his vote on HB 4361, which made a wide variety of tax changes, including the elimination of the Michigan Business Tax. As Gov. Rick Snyder notes here, his business tax plan would not have succeeded in a Proposal 5 world. It also should be noted that under the changes to income taxes on pensions approved by the House, Michigan retirees are treated differently, depending on their year of birth. Questionable statement: "Agriculture contributes over 1 million jobs to the State of Michigan, making it the number 2 job provider here." This claim is likely built on a much-referenced Michigan State University study. However, that study took an extremely expansive definition of agriculture as an industry. As reported back in 2011, a number of economists are harshly critical of claims made off the study. According to federal economic statistics, agriculture was the 14th largest industry in the state by gross product in 2010. Federal jobs data found about 70,000 farmers, managers, and field workers directly employed in agriculture, out of about 4 million jobs statewide. Questionable statement: "The recent passage of National HealthCare is not the answer. I believe we need to work to repeal and replace this legislation with legislation that makes health care available and affordable to all. Let’s make a real effort to reform medical malpractice litigation and work together to open competition in the insurance industry across state borders." The Affordable Care Act is a federal measure, so the holder of the seat from the 103rd District will not have a legislatively vote on its repeal or retention. Rendon is a co-sponsor of House Bill 4050 , which seeks to pass a ban on the individual health insurance mandate that is part of the Affordable Care Act. The bill was filed in January 2011, but has not received a vote in the House. Questionable statement: "We need to make sure that schools are held accountable for the quality of education they are providing. Competitiveness goes a long way towards accountability. First and foremost, the majority of each education tax dollar spent needs to go to the classroom." According to the Center for Educational Performance and Information, Michigan schools spent $8.96 billion in general funds on "instruction" costs in the 2010-11 school year -- out of $14.61 billion in total expenditures -- or 62 percent. CEPI defines instruction as, "The cost of activities dealing directly with the teaching of students in the classroom or in a classroom situation." Overall impression: Rendon's issues page is fairly general in its statements and is more a philosophical document than a discussion of policy options or factual matters. Foul or no foul: Foul. Rendon claims support for a supermajority rule on tax increases, yet he voted for the tax reorganization in 2011. His website clearly would mislead voters on that point. Agriculture does not generate more than 1 million jobs and it is not the No. 2 job provider. And a majority of each education tax dollar, according to CEPI, already is going into the classroom via "instruction costs." Questionable is the use of the phrase "Questionable statement" for every statement, even those that are factual and accurate. It biases the reader to assume that there is something wrong about the statement that follows, even if there is not. This is obviously a political motivated article. It lacks hard facts. The editor that let this article come out needs to Reread it.